BAKED | Baking and Caking! 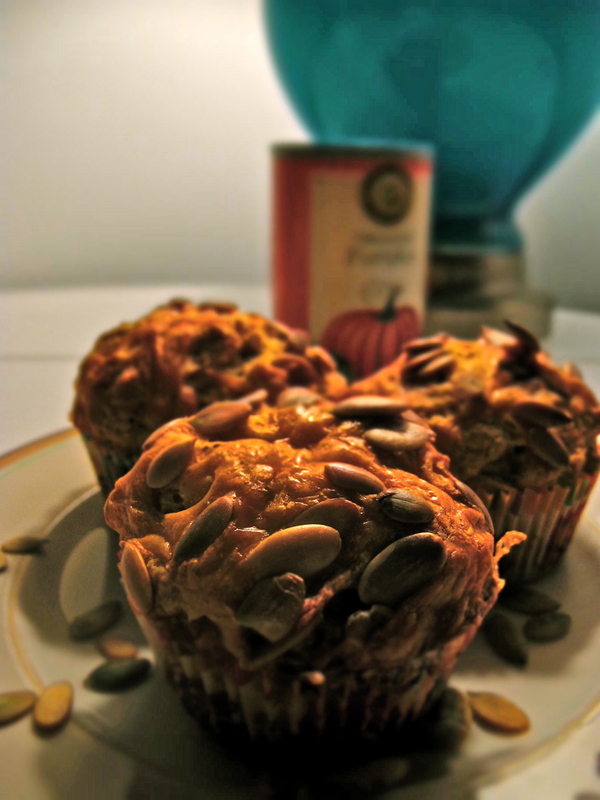 Have I ever mentioned that I like pumpkin 😉 I think it goes without saying that ever since getting this cookbook for my birthday last month, I have been dying to make these muffins! It saddens me so much to think, that while you can buy canned pumpkin anytime of the year, it’s really a fall season flavor. I have decided that I will not let this pumpkin stereotype hinder me and I shall continue to bake with pumpkin all year long, no matter the weather! These were super easy to make and would be the perfect breakfast muffin if one decided to wake up just 3o minutes early. Once all the wet and dry ingredients have been added together, the dough may seem a little dry, but not worry, as this is normal. Be sure to add some pepitas and extra cheese on top to give it that last boost of yumminess. These are definitely a little bit on the spicy side, but I’m sure one could leave out the cayenne and black pepper and they would still be quite enjoyable. 1) Preheat oven to 400 degrees F. Lightly oil a 12-cup muffin pan. 2) In a large bowl, whisk together the pumpkin and sour cream. Add the eggs and butter and whisk until combined. 3) In another large bowl, whisk together the flour, baking powder, cayenne pepper, salt, black pepper and brown sugar. 4) Make a well in the middle of the dry ingredients. Pour the wet ingredients into the well, and fold until just combined. Fold in three-quarters of the cheese. 5) Divide the batter among the muffin cups. 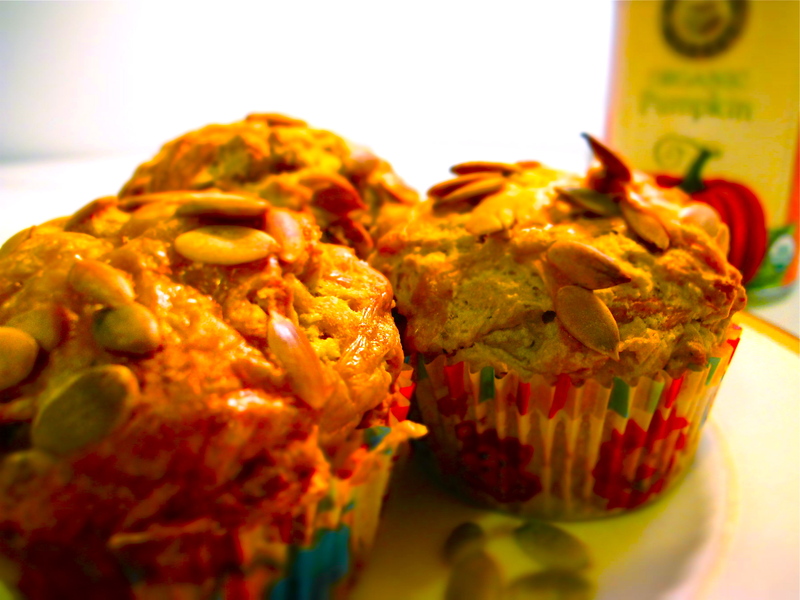 Sprinkle the remaining cheddar and the pumpkin sees on top of the muffins. Bake them for 20 minutes, or until golden brown. 6) Let the muffin pan cool on a rack for 10 minutes before turning out the muffins. Serve them warm. Makes 12 muffins. Sometimes, you have those nights, when it’s 9:30 pm, you want to bake something, but realize that anything you make is going to take almost an hour from start to finish (unless you make 5-minute cake of course). 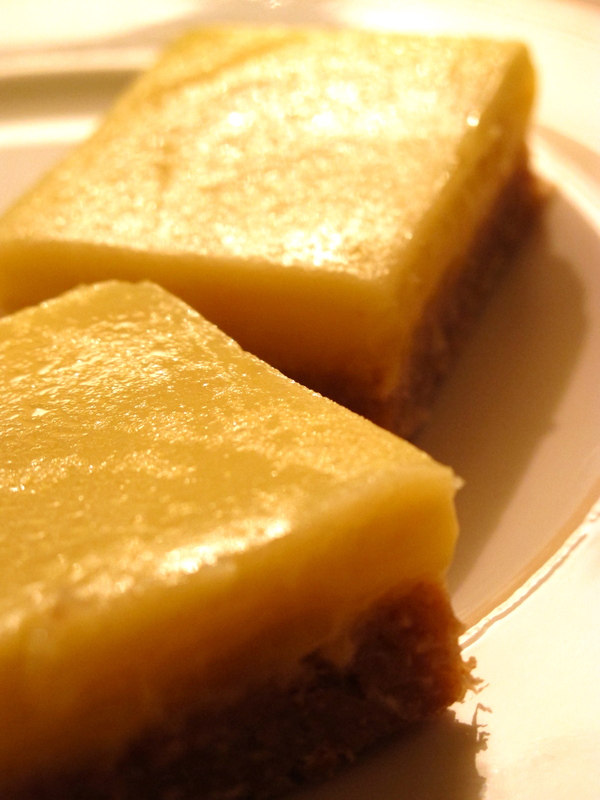 Well, that happened the other night and instead of settling on something that would actually be done in an hour, my roommates and I settled on lemon bars, which may take 10 minutes to bake, but then take another 2 hours to cool down in the fridge. Whoops! Well, we went forward anyway (actually, I didn’t realize they would have to cool for that long until I was half-way through making them, so there was no turning back). 1) Preheat the oven to 3oo°F. Butter the side and bottom of a 9×13 inch baking pan or spray with nonstick cooking spray. 2) Spread coconut on baking pan. Toast in oven for 7 to 10 minutes until it turns golden brown. Remove from oven, toss the coconut, and return it to over for 3 more minutes. 3) Put the graham cracker crumbs in large bowl, add the toasted coconut and brown sugar, and toss with hand until combined. Add the melted butter. 4) Use hands to combine, then turn it out into the prepared pan. Using your hands, press the crust into an even layer on the bottom and up the sides of the pan. Use the bottom of a measuring cup to create a perfectly even crust. 5) Put the crust into the fridge for 15 minutes, then bake for 10 minutes or until golden. Let the crust cool before adding the filling. 1) Increase over temperature to 325°F. 2) Whisk together the egg yolks, eggs, sugar, lemon and lime zests, and lemon and lime juices in large metal pot. Whisk until combined. 3) Cook over medium heat, whisking constantly, until the mixture registers 180°F on a candy thermometer – about 10 minutes. 4) Remove from heat and whisk in butter and cream. Pour through a fine-mesh sieve directly into the cooled crust. Use a rubber spatula to press the curd through the sieve. 5) Make sure the curd is evenly distributed. Tap the pan gently against the counter to make a level layer. 6) Bake for 8 to 10 minutes, until the filling is just set. Transfer to a wire rack and let cool to room temperature. Wrap the pan in plastic, being sure to not let the plastic touch the filling, and put in fridge for at least two hours. Pour over the crust and bake for 30 to 35 minutes (less if you are using the thinner topping), or about five minutes beyond the point where the filling is set. Let cool to room temperature. Cut into triangles and dust with confectioners’ sugar. It is currently 92 degrees at 8 o’clock in the evening! What has this world come to? The heat forecast for tomorrow is 98 with a heat index of 106. I think it’s about time that I make a trip to Iceland. I’m really hoping that I can get to the beach with my cousins this weekend, because when it’s so hot there is nothing better to do then lounge by the pool and walk down to the beach. The heat has also caused my poor herb plants to wilt horribly. I try and water them every evening, but even one night in this heat without h20 and they shrivel up. Oh well. My mint plant, that sits right on my window sill, somehow seems to beat the heat and grows so big that I’m worried about how I’m going to transport it when I move at the end of the summer. Anyway, this past weekend, my dad and step-mom came up to New York for a bar-mitzvah in New Jersey. It also happened to be the day after my dad’s birthday, so Friday night we threw a little soiree. It was loads of fun! I’d say we had about 18 people over who all enjoyed little snacks and champagne while enjoying the coolness of the dining room that had been pumped with air conditioning all afternoon. My contribution to the evening was obviously a dessert, but specifically a birthday cake! I don’t think I can go on much more about how much I loved the BAKED cookbook. It’s quite possibly my favorite thing ever. This cake came straight from those pages. I’d actually eaten this cake before when I went to the bakery itself in Brooklyn and wrote a review about it here, but now was my chance to tackle it myself. This cake is not that difficult in theory to make, but given my teeny kitchen and limited time I had, it obviously turned into a bit of a hassle. I made it in different parts, putting it all together Friday morning. If you have a nice long afternoon, putting it all together at once will probably save you some time and dishes. It’s an incredibly rich cake that is offset wonderfully by the caramel that is soaked into the layers. I was worried that the caramel was not the right consistency since it look really white and milky and I don’t have a candy thermometer to gauge the temperature in a sauce pan, but the milkiness was just from the sour cream and it turned out fine. I baked the cakes just a bit too long, but I still blame this on the faulty gas ovens. 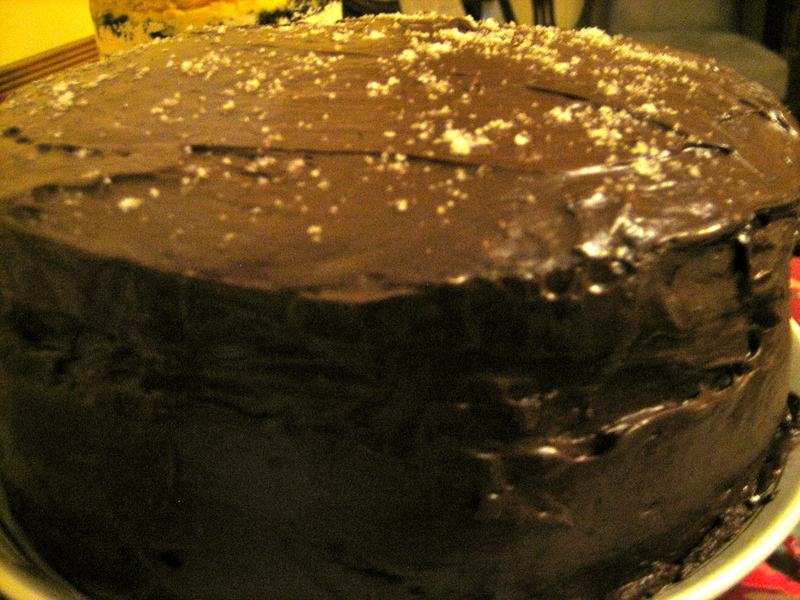 Once it was put all together, it had the perfect chocolaty taste with a hint of caramel throughout the cake and ganache. Of course, the fleur de sel sprinkled on top added the perfect after taste. I think that it was a big hit at the party! 1) Preheat oven to 325 degrees. Butter three 8-by-2-inch round cake pans. Line each pan with a parchment paper round, butter parchment paper and flour; set aside. 2) In a large bowl, whisk together cocoa, 1 1/4 cups hot water, and sour cream; set aside to cool, about 10 minutes. 3) In another large bowl, sift together flour, baking powder, baking soda, and salt; set aside. 4) In the bowl of an electric mixer fitted with the paddle attachment, beat the butter and shortening together until smooth and it appears to create strings inside the bowl, about 7 minutes. Add both sugars and continue beating until light and fluffy, about 7 minutes. Add eggs, one at a time, and beat until well incorporated. Add vanilla, scrape down the sides of the bowl with a spatula, and mix again for 30 seconds. Add flour mixture alternating with cocoa mixture, beginning and ending with flour mixture. 5) Divide batter evenly among the three prepared pans. Bake until cake is just firm to the touch and a toothpick inserted into the center of the cake comes out clean, 18 to 24 minutes. Let cool completely. 1) Combine 1/4 cup water, sugar, and corn syrup in a medium saucepan; stir to combine. Bring to a boil over high heat. Cook until the mixture reaches 350 degrees on a candy thermometer, about 10 minutes. 2) Meanwhile, in another small saucepan, mix together cream and salt. Bring cream to a boil and cook until salt has dissolved, 3 to 5 minutes. Remove from heat and set aside. 3) When the caramel mixture has reached 350 degrees, remove from heat and allow to cool for 1 minute. Carefully add the hot cream to the caramel; stir to combine. Whisk in sour cream. Cool, and store in an airtight container, refrigerated, for up to 3 days. 2) In another small saucepan add cream and bring to a boil. Remove from heat and set aside. 3) When the caramel mixture has reached 350 degrees, remove from heat and allow to rest for 1 minute. Add the hot cream to the caramel; stir to combine. Let cool 5 minutes. 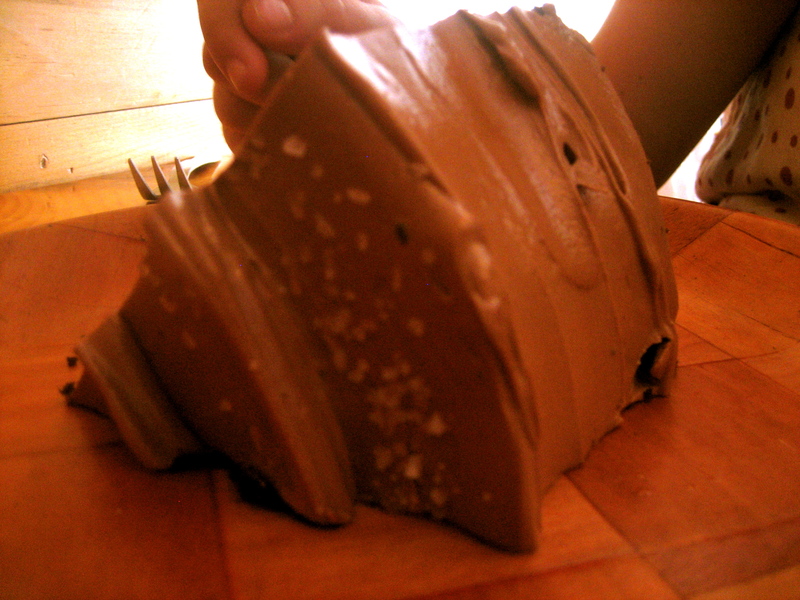 Place chocolate in the bowl of an electric mixer and pour caramel sauce over chocolate. Let sit 1 minute before stirring from the center until chocolate is melted. 4) Attach bowl to electric mixer fitted with the paddle attachment and mix on low until the bowl feels cool to the touch. Add butter and increase speed to medium-high until mixture is well combined, thickened, and slightly whipped, about 2 minutes. 1) Using a serrated knife, trim tops of cakes to make level. Place four strips of parchment paper around perimeter of a serving plate or lazy Susan. Place the first layer on the cake plate. 2) Using about 1/4 cup of the caramel, spread a thin layer on the cake, allowing some of the caramel to soak into the cake. 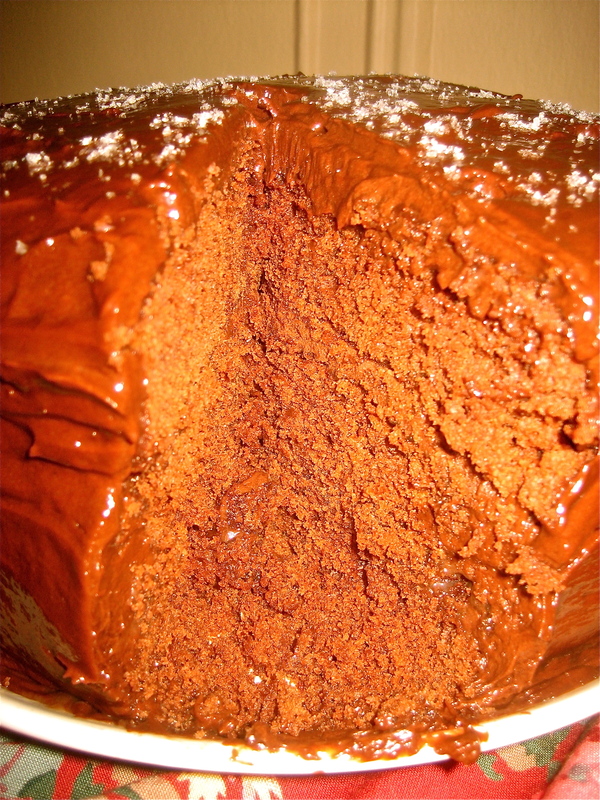 Follow the caramel layer with a layer of about 1 cup of the ganache icing. Place the second layer on top and repeat process with another layer of caramel followed by a layer of ganache icing. Place the remaining layer on top of the second layer bottom side up. 3) Spread entire cake with remaining ganache icing. Sprinkle with fleur de sel. Oh boy oh, is summer upon us! It was in the high 80s today and it’s supposed to get into the 90s tomorrow. Not that I don’t love the heat, I do, but it gets to a point where it’s just too hot. And with the humidtiy, I’m done for. I guess I can’t really complain though, since there’s nothing I can do about it. I do plan on getting to the pool/beach as soon as possible. I don’t understand why everything waits until Memorial Day to open, even though it’s clearly hot before then. Anyway, as I’ve written many times, I’m much more of a cookie person than a brownie person. I think it’s easier to adjust baking times and ingredients with cookies whereas with brownies you have to bit a more careful. Than being said, I decided to make some the other night from the BAKED cookbook. Now these guys pride themselves on their famous brownie, so I had some high hopes. Obviously I should have read the recipe beforehand because as I was about half way through mixing up the ingredients I realized I didn’t have enough eggs – more like I broke two so was only left with four. But the ones I was left with were extra large so I figured it would be okay. My second gaffe was that I didn’t have the right size pan, but I procedeed anyway with a smaller and it actually made them even better in my opionion. These are not your usual cakey sweet brownies. 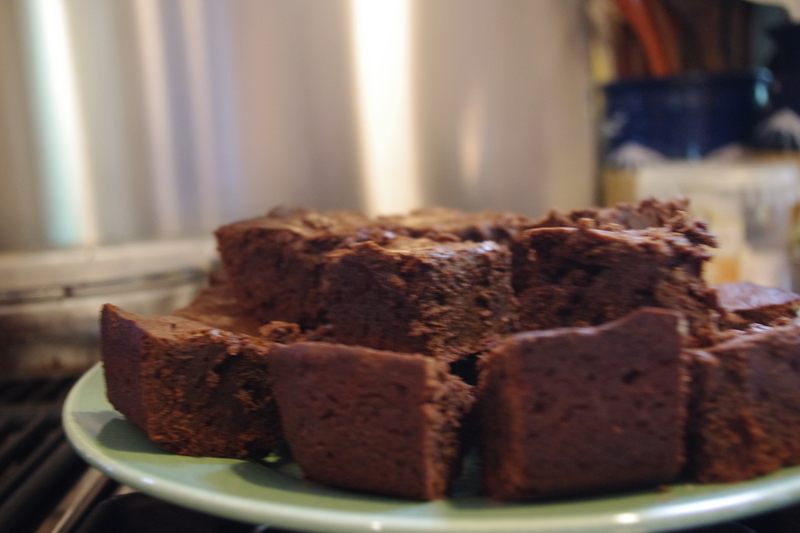 They are deep and rich with a hint of coffee and given my small pan, they were very fudgy. I upped the baking time a little because I knew they were a little thicker than the recipe called for, but not by too much because I still wanted them to be fudgy and chewy on the inside. 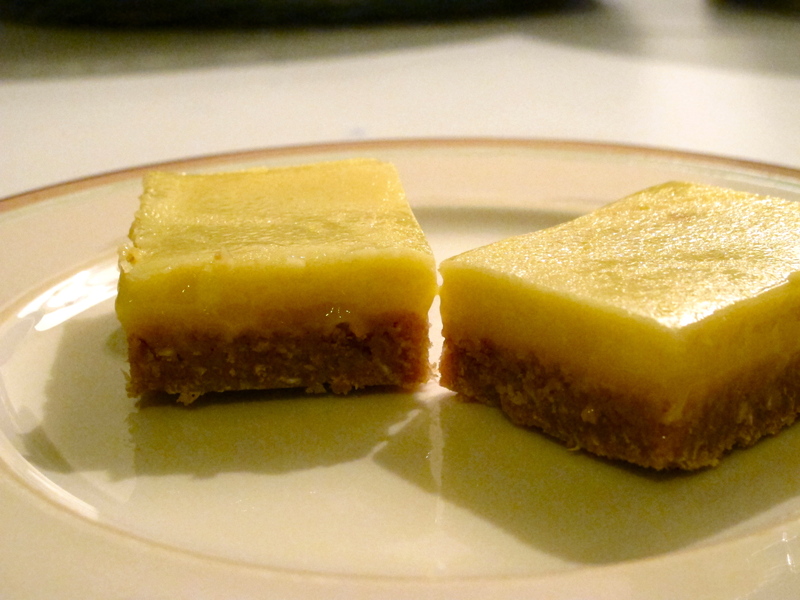 It’s really essential to cut these into small squares because they are just so rich in any one bite. This will definelty bump to the top of list whenever I need to make brownies again, although I might try and find the right size pan next time. 1) Preheat the oven to 350 degrees F. Butter the sides and bottom of a 9-by-13-inch glass or light-colored metal baking pan. 2) In a medium bowl, whisk the flour, salt, and cocoa powder together. 3) Put the chocolate, butter, and instant espresso powder in a large bowl and set it over a saucepan of simmering water, stirring occasionally, until the chocolate and butter are completely melted and smooth. Turn off the heat, but keep the bowl over the water and add the sugars. Whisk until completely combined, then remove the bowl from the pan. The mixture should be room temperature. 4) Add 3 eggs to the chocolate mixture and whisk until combined. Add the remaining eggs and whisk until combined. Add the vanilla and stir until combined. Do not overbeat the batter at this stage or your brownies will be cakey. 5) Sprinkle the flour mixture over the chocolate mixture. Using a spatula (not a whisk), fold the flour mixture into the chocolate until just a bit of the flour mixture is visible. 6) Pour the batter into the prepared pan and smooth the top. Bake in the center of the oven for 30 minutes, rotating the pan halfway through the baking time, until a toothpick inserted into the center of the brownies comes out with a few moist crumbs sticking to it. Let the brownies cool completely, then cut them into squares and serve. 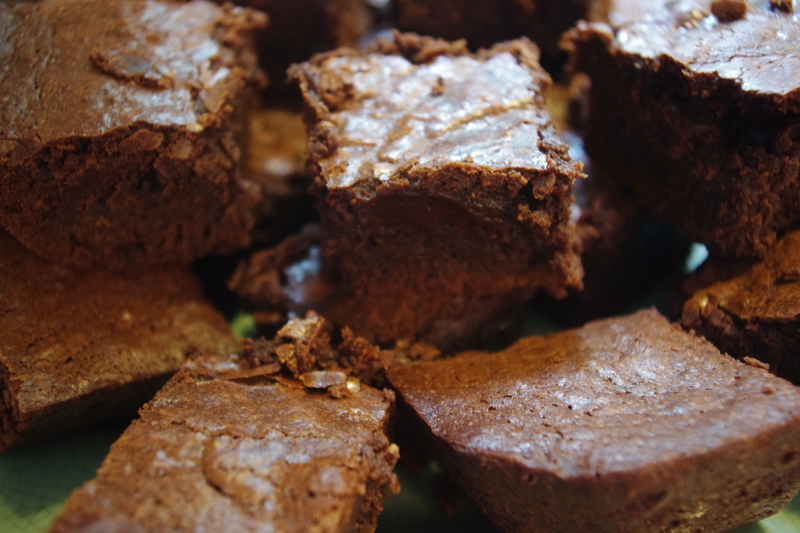 7) Tightly covered with plastic wrap, the brownies keep at room temperature for up to 3 days. This past weekend, one of my best friends from North Carolina came to visit me in New York City. It was so much fun. I do not think I have covered so much territory in New York in one weekend ever. We went to Chelsea Market, saw Promises Promises – which was amazing! and we saw Kristen Chenoweth after the show – we walked all around Brooklyn, went to a street fair, a few flea markets, and just had a great time all around. Included in the weekend of festivites, we obviously ate a whole bunch of food. We went to Cafe Lalo for brunch on Sunday, which was delicious as usual, had lemonade at the street fair and even made our very own burritos at home on Thursday evening. It was a great trip and am looking forward to more friends visiting over the summer so that I’ll have an excuse to do all these fun things once again! Now I have been dying to go to BAKED in Brooklyn for ages and ages. I had the granola they make and sell at supermarkets at a friends house a few years ago and fell in love. It is by far some of the best (and most expensive ;-)) granolas ever, but so worth it. After trying the granola, I looked them up online and saw that they had both a store in Brooklyn and in Charleston, South Carolina. I always had a sneaking desire to go but never actually took the prerogative to hike out to Red Hook in Brooklyn, but last Chaunkah my uncle gave me their cookbook and of course I wanted to go 10 thousand times more. How I’d never gone before makes no sense now that I’ve been, but we decided to finally go this past weekend and it definielty lived up to all my expectations. First off, BAKED is in Red Hook, which is not the easiest place to get to. So after spending the morning at the Brooklyn flea market and then getting on and off about ten different subways and buses because nothing ever works on the weekend, we finally made it. We were all famished, but with my sweet tooth, I settled on a huge chunk of Sweet & Salty cake to ease my hunger instead of something a little more well rounded like quiche or a sandwich. I think I made a good choice though because it was so good! One of my favorite things is flakes of salt sifted atop a cake or cookie and this didn’t fail to please me. 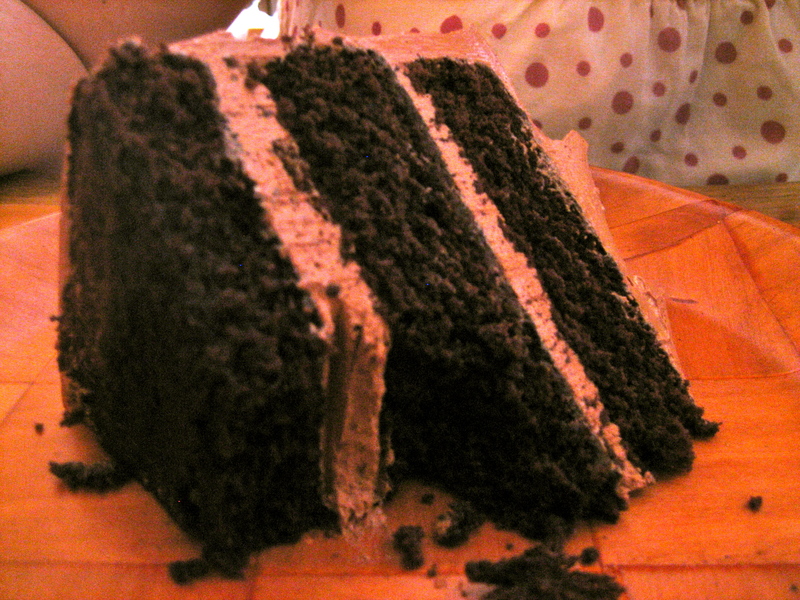 The cake was an intense dark and rich chocolate cake with a light and fluffy whipped chocolate caramel frosting that complemeted each other perfectly. The flakes of salt were sprinkled on top of the cake, so although you didn’t get a salty taste each forkful, it was okay. Given how rich the cake is, with the caramel infused into it, one slice could easily be shared. Given how hungry I was, I thought I would be able to finish the whole piece on my own, but alas, I let the others at the table have their fair share and there was still even some left on the plate as we left. I was so excited to go to BAKED after having been waiting to go all year and now I can finally say I’ve been. As far as it might be from my apartment now, I’m sure I’ll make the sojourn again soon, but while I’m waiting I guess I’ll just have to keep making some yummy yummy recipes from their cookbook.